SANTA FE – Many hunters will be taking to the woods and fields across New Mexico starting Sept. 1, the opening day for deer, elk and turkey archery hunts and for most small game and upland game birds. Hunting seasons for doves, blue grouse, band-tailed pigeons and squirrels will open in many areas of the state starting Sept. 1. 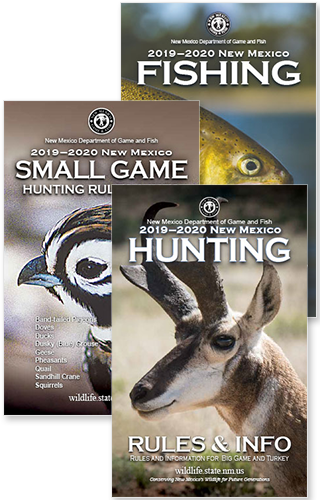 Licenses, maps, questionnaires and other related materials are available online at the Game and Fish Department’s website, www.wildlife.state.nm.us. The 2015-16 migratory game-bird hunting rules and information booklet is available on the department website. Printed copies will be available soon at game and fish offices and license vendors. The department will accept draw applications for sandhill crane and pheasant hunts from Sept. 2 to Sept. 30. Apply online with a customer account at www.wildlifestate.nm.us or by phone at (888) 248-6866. A list of available hunt dates and more information about bag limits and seasons is available on the department website. This year, department staff manning crane harvest check stations also will inspect harvested ducks for evidence of avian flu, said Kristin Madden, bird program manager for the department. Pronghorn antelope hunting season began in early August and is ongoing while big-game muzzleloader and rifle hunts commence later in the fall and continue through the early winter. An estimated 36,000 elk hunters, 27,000 deer hunters, 4,400 pronghorn hunters and 30,000 small-game and bird hunters are expected to be in the field this season. For more information about hunting in New Mexico please visit the Department’s website at www.wildlife.state.nm.us.